The seeder SP 3.6a is essentially a basic grain sowing row family. It is best used in single-row embodiment provided on the area up to 40 m. Device equipped with overlap portions grain sowing apparatus to form a technical track in case of intensive vozdelki agricultural crops. are used with various coulters and sets sealing bodies in consequence of which can be converted into different execution. It is also possible the use of three NW 3.6a with EGR coupler 10.8 thereby forming hydroficated shirokozahvatyvayuschy aggregate (seeders fastened in a staggered order) for seeding grain. The hitch is aggregated with tractors of not lower than third class trailer method. The kit includes hydraulic markers, which is controlled from the cab. In the event of a transfer to the transport position the width of the coupling is only 2.4 meters, thus allowing to move on the roads obschegogo destination. 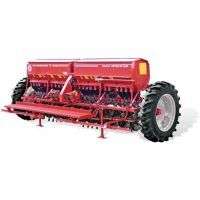 Seeder EGR 10.8 makes it possible to increase efficiency by 1.5-2 times.